The Heinrich Böll Foundation has awarded Chinese defence lawyer and human rights advocate Zhang Sizhi with the 2008 Petra Kelly Prize. Sizhi is known among Chinese lawyers as “the conscience of lawyers” and, since the early 1980s, has been defending critics of the Chinese government indicted by Chinese authorities. 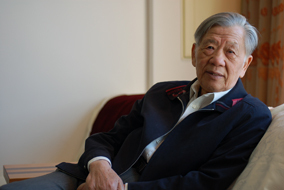 Among his most famous clients are the political dissident Wei Jingsheng, who used to spread his call for democracy with political posters, the sociologist Wang Juntao, who gave advice to students involved in the 1989 Tiananmen Square incident, and Bao Tong, the personal secretary of the liberal former communist party chair, Zhao Ziyang. Zhang Sizhi was among the first lawyers in the Peoples Republic of China, starting out in 1956 when he was first admitted to the bar. Only one year later, in 1957, Mr. Sizhi was sentenced to 15 years of compulsory labour for being a dissident. His first case dealt with the “gang of four”, who were connected to Mao’s wife Jiang Qing. Many political trials followed. To this day, with his publications and his teachings, Zhang Sizhi continues to contribute to the development of China’s legal system. Zhang Sizhi was honoured with the award during a special ceremony held on December 2, 2008 in Berlin. Germany’s Federal Minister of Justice, Brigitte Zypries, delivered a speech in honour of Mr. Sizhi. The Heinrich Böll Foundation awards the Petra Kelly Prize – the prize money is 10.000 euros – every two years to a person committed in an outstanding way to universal human rights, to non-violent strategies of solving conflicts, or to the protection of the environment. In 2006, the prize was awarded to Russian human rights lawyer Yuri Schmidt, who was responsible for the defence of Mikhail Khodorkovsky. In 2004, the Petra Kelly Prize went to Wangari Maathai, the Kenyan environmental and human rights activist, who in the same year went on to become a Nobel Peace Laureate.